San Antonio Bay, Ibiza. Summertime, beach-side, chill-out restaurant and bar in the San Antonio bay. Offers a unique ambience and fantastic Bohemian décor. Imaginative Asian influenced cuisine. The alternative venue to the ubiquitous sunset strip. Summertime, beach-side, chill-out restaurant and bar in the San Antonio bay. Offers a unique ambience and fantastic Bohemian décor. Imaginative Asian influenced cuisine. The alternative venue to the ubiquitous sunset strip. Kumharas is a summertime, beach-side, chill-out restaurant/bar with a unique ambience and decandently Bohemian decor. Situated in the bay of San Antonio, Kumharas offers three different environments in which to dine; a relaxed chill-out area, an intimate lounge area with haimas, or a more traditional dining room. Slip into an intimate corner or relax on a cushion, Morrocan style and enjoy the bold architectural features this beautiful venue offers. 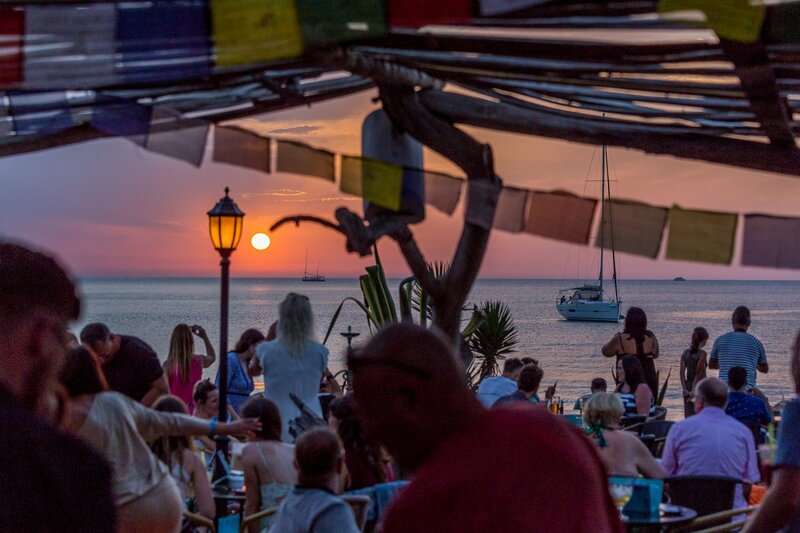 Or simply enjoy a mouth-watering cocktail while watching the sun sink into the sea with regular live music and top DJs spinning tunes as the sun sets. The menu is varied and imaginative with regular new additions and a vibrant Asian influence. Their chefs aim to provide a perfect blend of flavours and international cuisines using Ibiza's best, freshest products. Kumharas is able to cater for all types of events, from business dinners to weddings, and is open every day from 10am during the summer. Call us on +34 971 80 57 40 or send a booking request below.